Are you under the impression that rocking short hair means limited styling options? Think again! You would be surprised to find out how many updos for short hair you can try out. 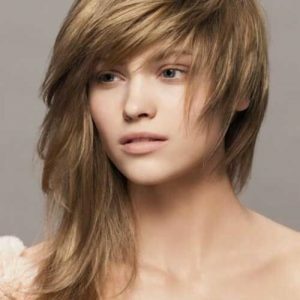 From long bobs to pixie haircuts, you can enjoy a myriad of hairstyles that will bring out the best in your short and sassy strands. 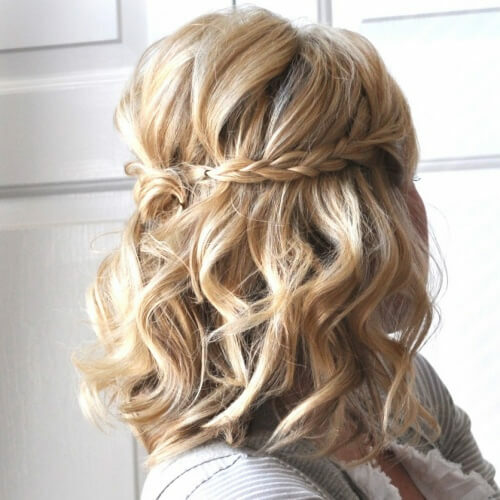 Put together your very own hairstyle heaven with the ideas below! What better way to start our list of updos for short hair than with a classy hairstyle? 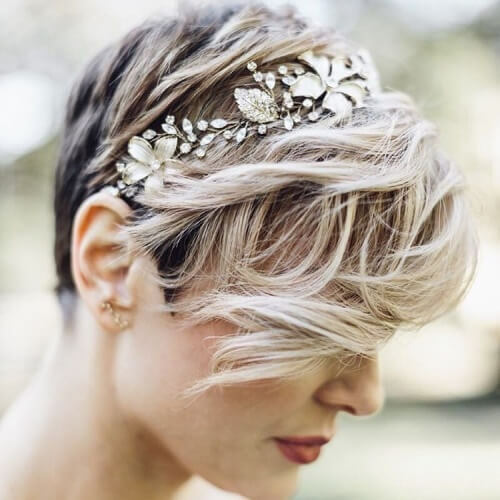 Regardless of how short your hair is, don’t shy away from using elegant hair accessories. For instance, these two dazzling hair pins will make any updo shine. When researching updo hairstyles, you will often find that chignons top all lists. If you’re ever in doubt about styling your playful locks for a formal occasion, we always recommend that you consider this hairstyle. What if you don’t have a lot of time at hand? Some updo hairstyles for short hair are so simple that you can DIY to perfection in a few minutes. For example, this half up half down hairstyles requires just a quick twist and you’re ready to go. One of the many beauties of braids is that they cater to all situations. While you can use them for an urban glam look, you can also incorporate them into any fancy hairstyle. 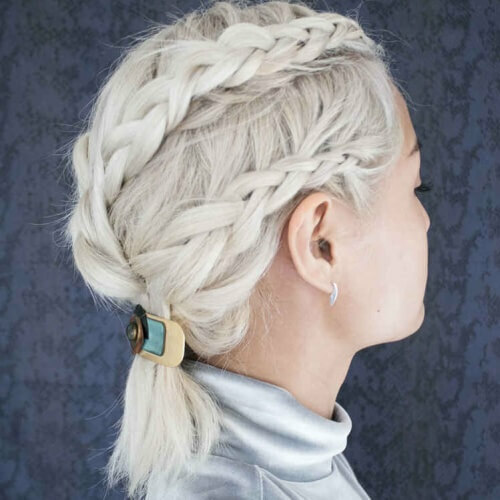 Here you can see how to braid your way to the updo of your dreams. Speaking of refined hairdos, we couldn’t have possibly tackled updos for short hair without considering bridal hairstyles. 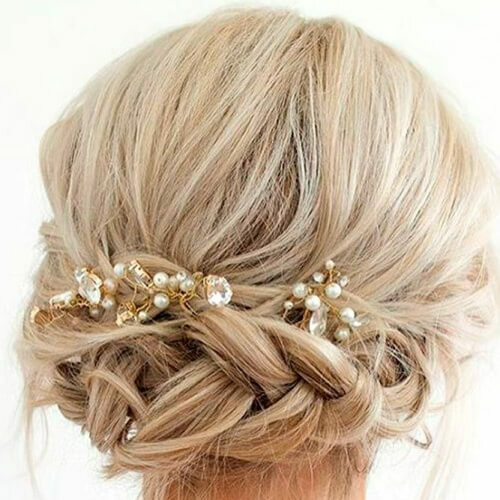 If you want to tie the knot fabulously, think about adding some delicate accessories in your hair. A few white roses are always an excellent way to start. Afro-textured hair is a dream come true for women who long for intricate hairstyles. Even if your corkscrew curls are super short, you can twist them in the back and let them unravel and bounce around freely at the top. Retro hairdos are almost synonymous with fine tastes. Although this category of updos for short hair require a bit more time, patience and expertise for styling, the results will be worth it. The graceful inwards curls are the key to success. Ladies with bob haircuts can easily rely on this kind of hairstyle for a speedy yet memorable look. 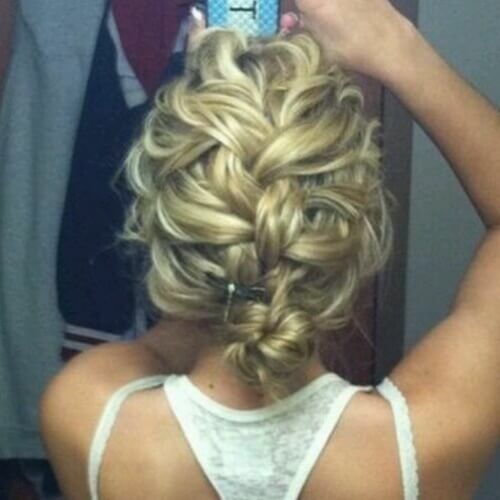 All you need is a curling iron, a few bobby pins and a generous amount of hairspray. Curl your tips, pin them one into the other and spray them in place. Fine hair can prove to be tricky from time to time when styling is in discussion. If you want to create the illusion that your hair is thicker or more voluminous, bouffant hairstyles are just what you need. Tease it up, ladies! Have naturally curly hair and love it? 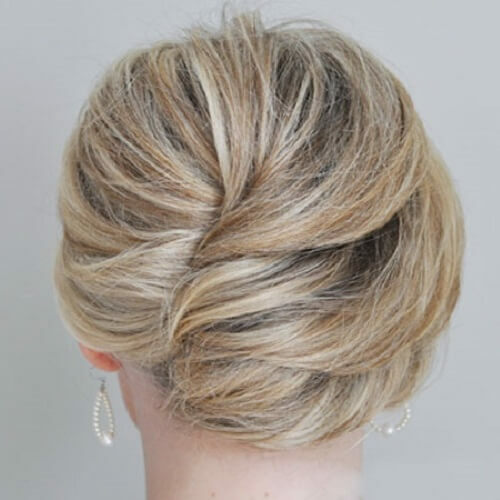 Use an abundance of pins to swirl your way to one of the most enchanting updos for short hair. Like with most other ravishing hairstyles, hairspray is mandatory, especially if you want the updo to resist throughout the night. Think braids won’t work on short hair? Challenge accepted! As long as you have any hairstyle a bit longer than a pixie cut, you can experiment with various braiding styles. 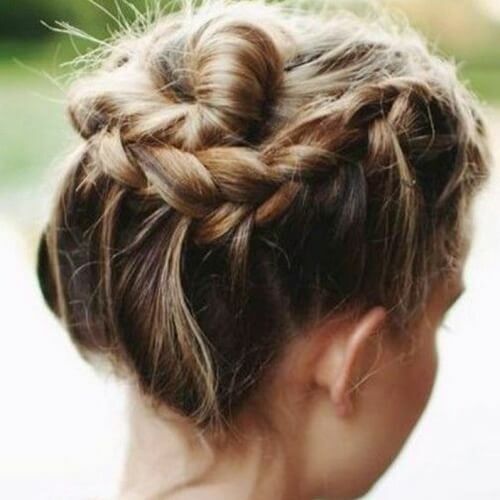 For example, this loose French braid beautifully ends in a tiny twisted bun. Time and time again Rihanna proves that she is a veritable hair queen. Whether we see her with traditional African hairstyles or short and spikey cuts, she always slays. In this photo, she opted for a lavish pompadour to flatter her shorter locks. Another braiding technique you can look into is the crown braid. Also known as a tiara or halo braid, this hairstyle involves creating a French braid across the crown of your head. 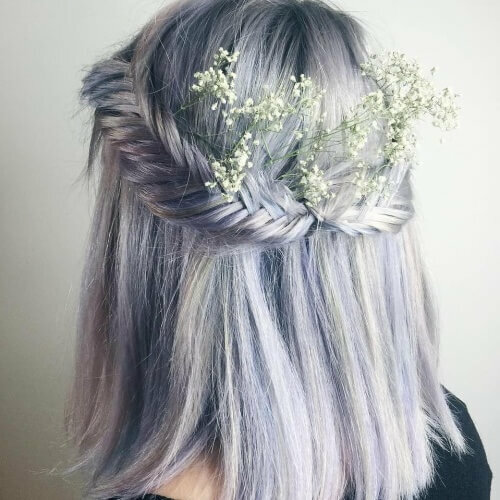 Alternatively, braid all the way around to create a halo effect. This pretty hairstyle is as easy as 1, 2, 3, not to mention that it works for hair of all lengths. Simply take a few strands on each side and twist them in a crisscross manner, pinning them in the center. You will be radiant! 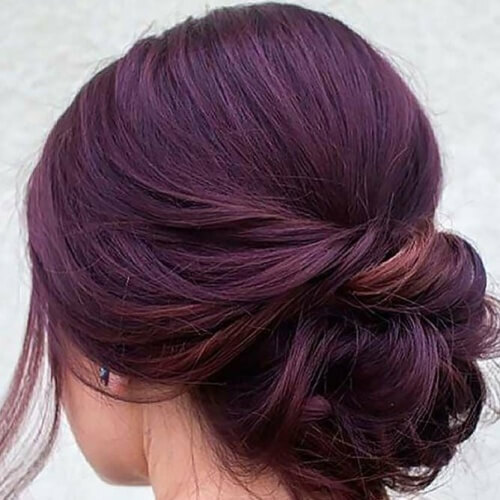 While tightly styled updos are obviously eye-catching, loose hairstyles have a unique charm of their own. In addition to this, they stand out against other fancy hairstyles through the lack of rules. Feel free to style your hair loosely as you please! This is yet another inspiring hairstyle for women with bob haircuts. It goes by the same principle of twisting, pinning and spraying in place. Like with the updo style we mentioned above, you shouldn’t be afraid of leaving a few stray strands in front. Instead of creating a tiara or crown braid, you can apply a similar technique at the back of your head. 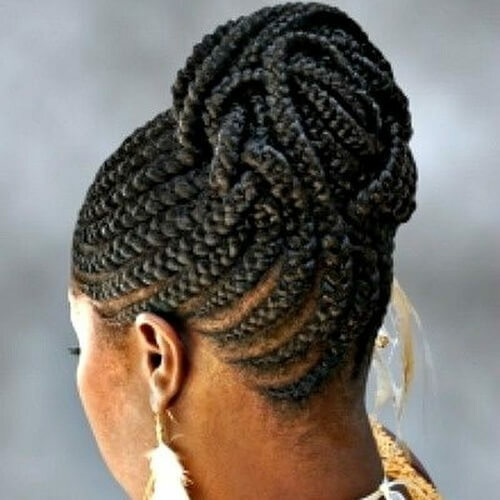 Make sure you braid horizontally, just above your nape. To glamorize the overall look, add some sparkling accessories like the ones shown in this photo. Ah, faux hawks, what would we do without you? One thing’s certain, if this concept didn’t exist, we would have ourselves shaving the sides of our head more often than we’d like. Instead, we can fake it till we make it with class. 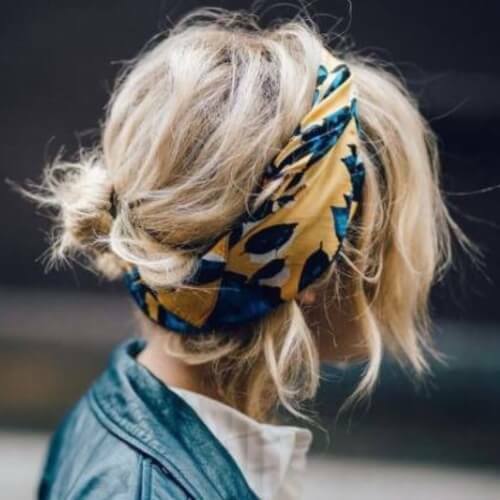 As far as accessories that work well with updos for short hair are concerned, headbands are also a must have. They can help you wrap your short strands up easily, without the need of any additional accessories. You can frequently find small braids and twists in updos for short hair, but what if you combine them? The outcome is nothing less than breathtaking. Another major advantage is that this hairstyle can be applied to long pixie haircuts and bobs alike. Want an effortless yet unforgettable trendy hairstyle to complement your short hair? You will be pleasantly surprised to find out that twisted low buns are always in fashion. Just twist your hair into a spiral and secure the bun in place. It’s easy to understand why messy and classy are now almost the same concept. A few loose strands and a teased top can go a long way for any updos for short hair. Moreover, you can adapt them for fancy and casual occasions all the same. Hairstyles that are half up half down are wonderful for multiple reasons. One of the main ones is that they can be used for short, medium or long hair equally well. 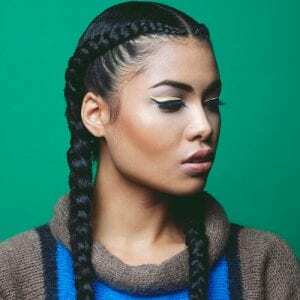 For shorter hair, braid two strands on each side and connect them in the middle. Naturally, the shorter your hair is, the harder it will be to use hair ties or other similar accessories. Nonetheless, one hair accessory that should be part of your staple pieces is the metallic headband. 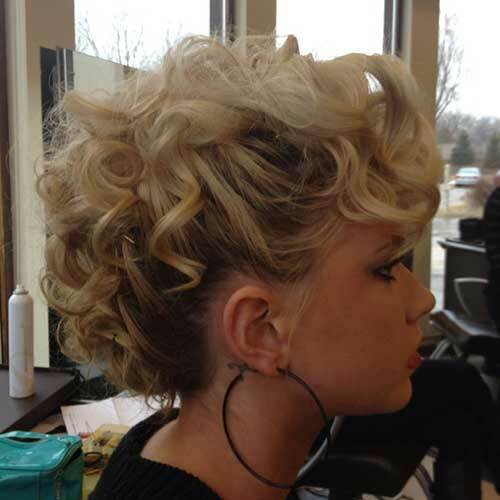 Applying one to your pixie cut can create the superb illusion of an updo. 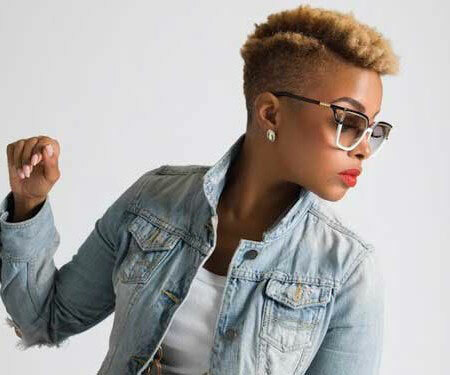 We love faux hawks so much that we strongly believe they deserve a secondary entry on our list, this time with a different technique. Another way to create a faux hawk is to knot your hair on the fanned part. Remember what we said about half up hairstyles for short hair? Well, this example strengthens our claim. You can obtain a picture-perfect hairstyle by twisting pieces of hair on each side with a half up half down result. 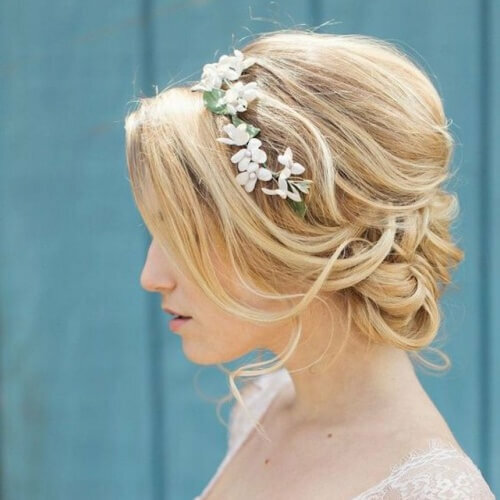 We’re accustomed to talking all about wedding hairstyles, but we usually focus on the bride. But how about bridesmaids? 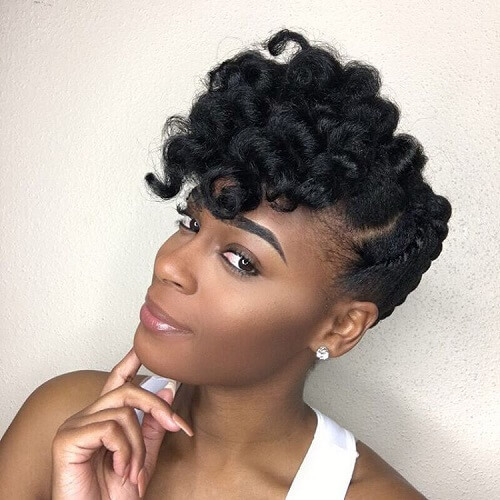 If you’re one of the best friends of the lady of the hour and you have short hair, don’t hesitate to let yourself be inspired by this hairstyle. Do you prefer more of a high fashion touch to your hairstyles? Even if you have shorter hair, you can experiment with this fantastic hairdo. 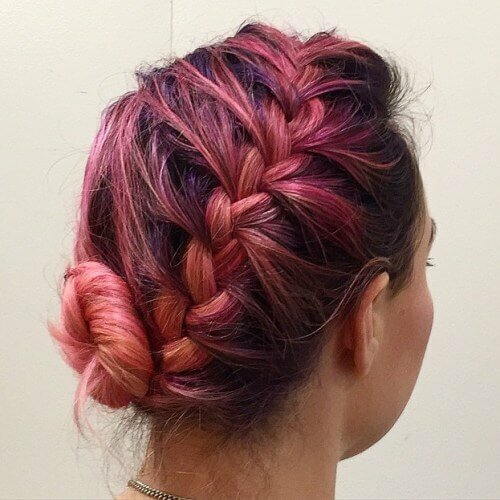 What we love most about it is that the braid in the middle creates the illusion of a mohawk in a stylish way. 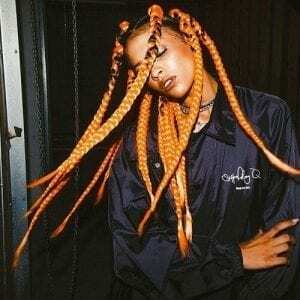 You will usually see pull through braids on very long hair. You don’t need to worry though, you can adapt them for your neck-length locks. 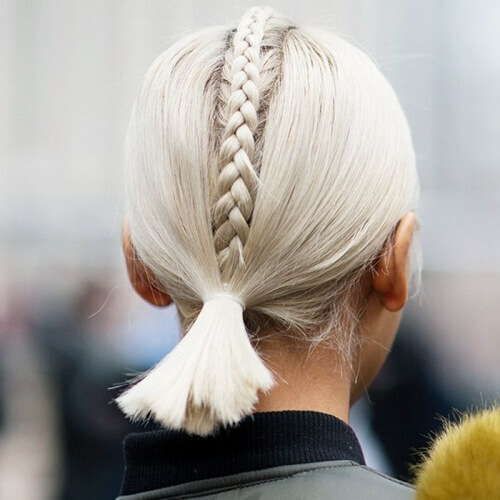 While you might not be able to have numerous knots throughout the braid, you can rock at least two flawlessly. Can you say adorable? 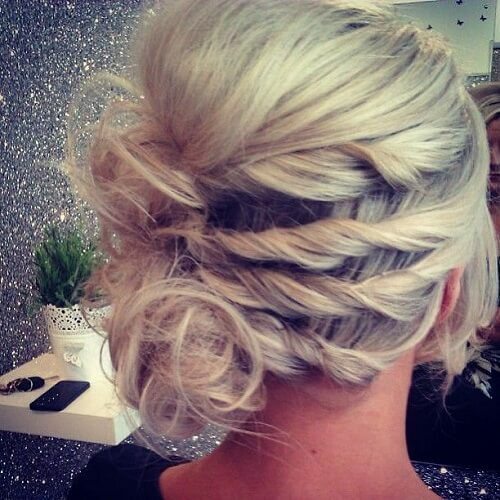 We love the imagination applied for this hairstyle, and the way the braid was introduced creatively. 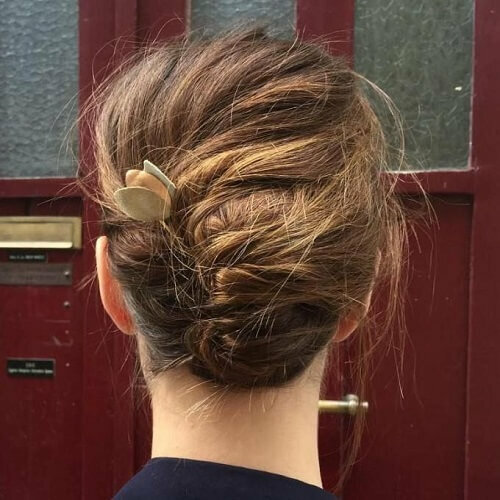 It starts with a braid on the top, which spirals into a cute, small, twisted bun at the end. Another incredibly elegant hairstyle is the French twist. While it works the best with straight hair, it can also be tailored for wavy or curly locks too. Believe us, ladies – you can’t go wrong with this one for black tie events. 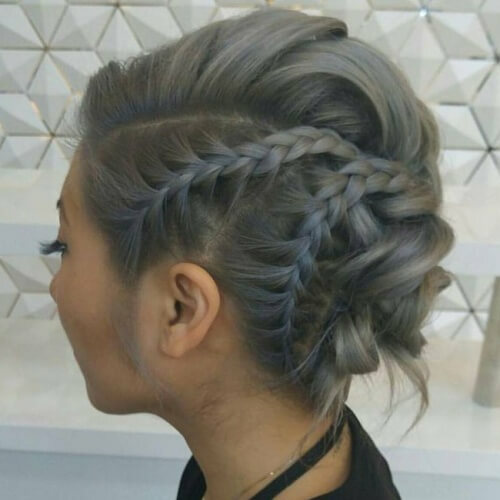 Braids on one side are one of the most popular options among updos for short hair. In this case, an ample plait was braided loosely to one side of a long bob. It’s a terrific hairstyle for girls who sport side parts. 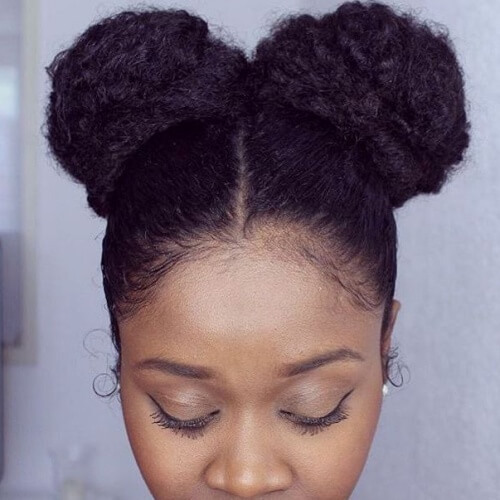 Yet another trendy updo for afro-textured hair is the 90s-inspired space buns. They are also referred to as double puffs, and they’re guaranteed to bring out your inner geek girl. The results are sweet, chic and irresistible. Remember when we were little girls and we adored putting ribbons and bows on everything? Well, you can bring back your childhood passion without a care in the world, as bows are totally in. 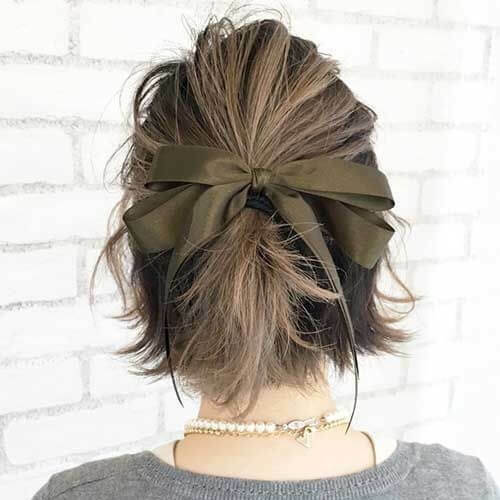 All you have to do is part your hair half up half down and tie a ribbon in the middle. 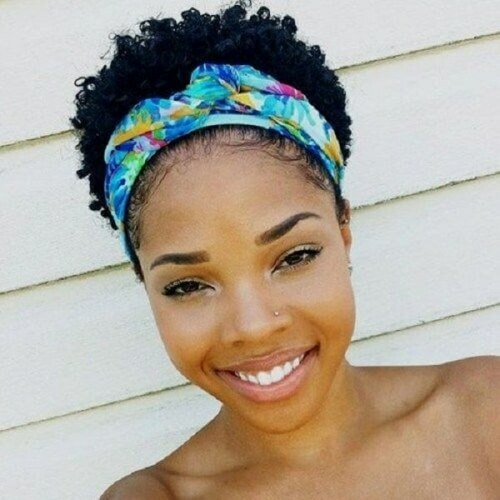 Just like headbands and tiara, headwraps are delightful accessories regarding updos for short hair. If you don’t have a headwrap, you can also use a scarf for a similar effect. Make sure you leave plenty of loose strands in the front. Sometimes, a small touch can go a long way for your hairstyle. For example, ladies with long bangs can twist them for a fast and fantastic look. While it won’t require a lot of time, it will be remarkable for sure. Release your inner boho chick! Another half up half down updo for you is this spectacular fishtail braid idea. Instead of braiding all of your hair with the fishtail technique, use it just for two large chunks of hair on the sides. Don’t forget the flowers! As you have most likely noticed, twisting is essential for styling short hair. 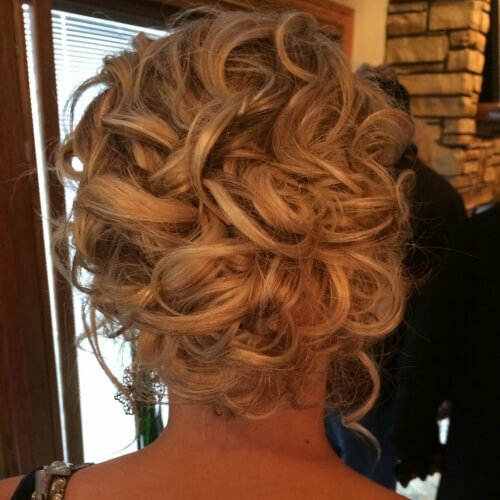 In this example, you can see how four side twists were styled into an ultra chic updo. Feel free to tease the top for added volume without much effort. You might not be able to rock a full top knot if your hair is really short, but you can always get the second best option. Part your hair like you would with any other half up hairstyle and carelessly tie the top part in a messy bun. Similar to the French twist, the French roll is also an unmistakable sign of refinement. Nonetheless, the styling technique is a bit different, focusing on the inwards “rolling part”. You can also add a pretty like accessory on one side. Fishtail braids have made our list again, this time with a one-sided approach. If you want a hairstyle that has more chances of making heads turn, you might want to go with this one. The fishtail braid is wide, thick and definitely an original approach to hairstyling. 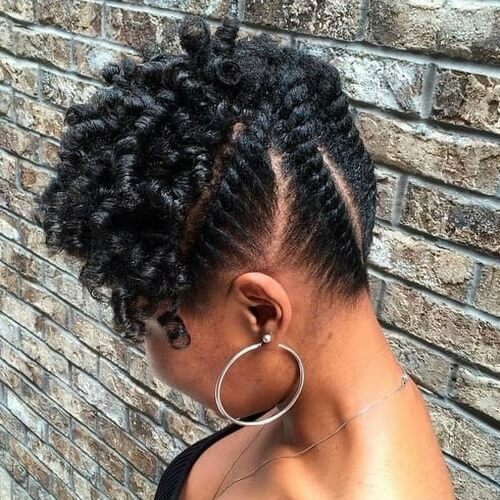 If you want to grow out your natural hair in a healthy way, we recommend that you look into protective hairstyles. 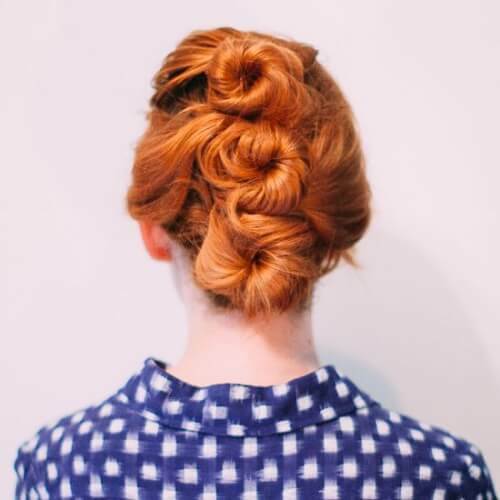 With the help of safe braid extensions, you can make your super short locks a little bit longer, like with this braided updo. 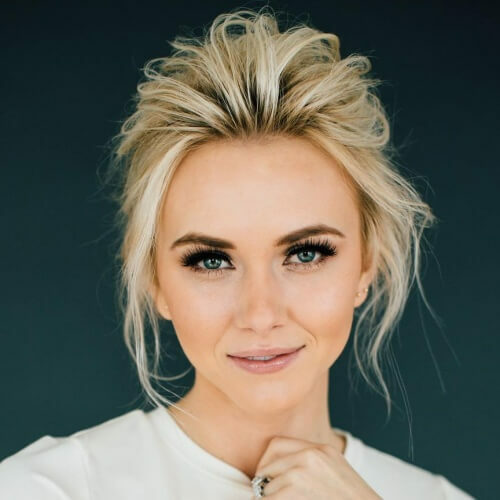 While this hairstyle isn’t technically an updo, it has a similar effect that ladies with extremely short hair will appreciate. The most significant “ingredient” is to slick your hair back entirely. After that, create a small and tight braid on one side. Why go with the crowd when your hairstyle can be totally out of the box? Instead of braiding only on one side or straight down your head, try a diagonal approach. You can end it all in a timeless twisted bun tucked gently to the side. If you haven’t heard of Game of Thrones by now, there are fair chances that you have been living under a rock. All jokes aside, one of the most unforgettable characters in the series is Khaleesi. Her braided hairstyle has inspired this charming look. Even though your hair needs to be a bit longer for this one, you can nail it if you have shoulder-length locks. 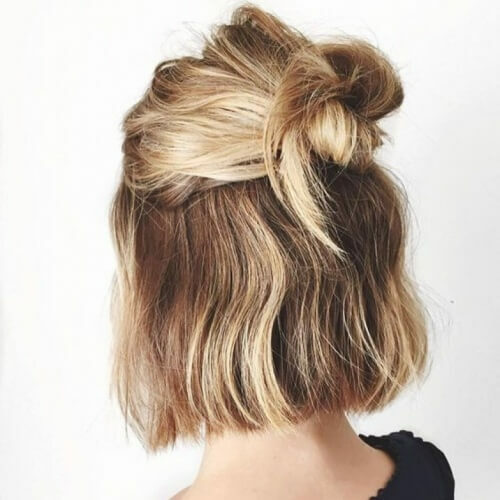 Multiply a regular twisted bun by three and you’ll get a delicate and creative hairstyle to spice up your outfit. Want to go full-out natural? 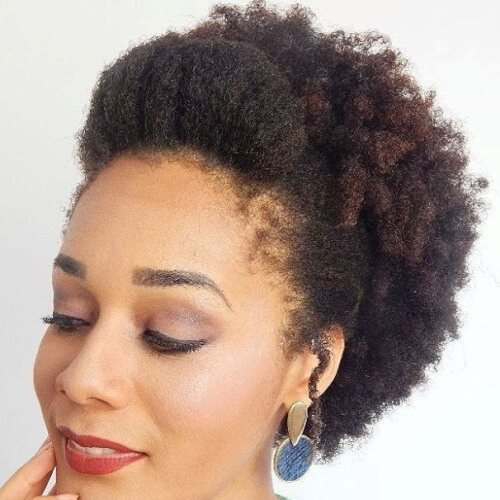 Embrace your natural afro-textured hair wholeheartedly with a hairstyle like this. Aside from the admirable updo part, we also like the puffed up bangs in the front. We recommend it for a modern-retro look. 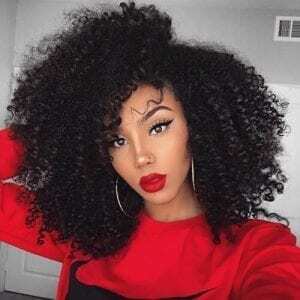 Women with wavy or curly hair will adore this hairstyle. Gently pull all of your strands to the side and pin them into a glamorous chignon. 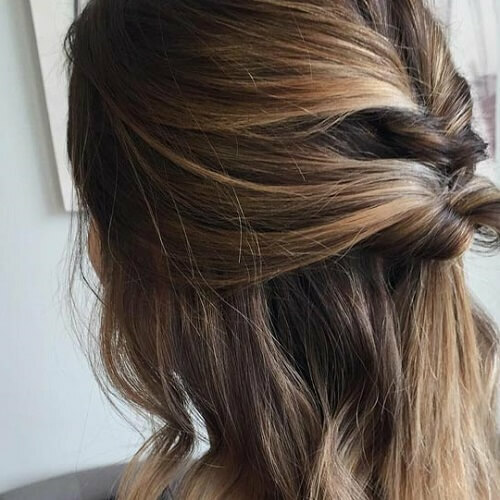 This hairstyle is fit for even the fanciest of events, from cocktail parties to weddings. 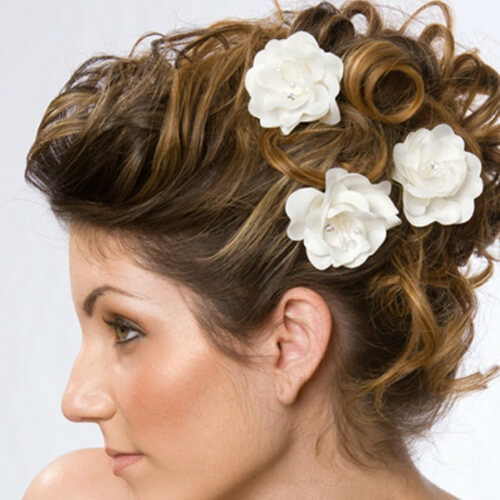 If you want to make your pinned updo even more appealing, all you need is a thin, classic accessory. This tiara-headband may not seem like much, but it can make the whole difference for the outcome of your appearance. Finally, we’ll end our list on a glam note with pin up updos for short hair. 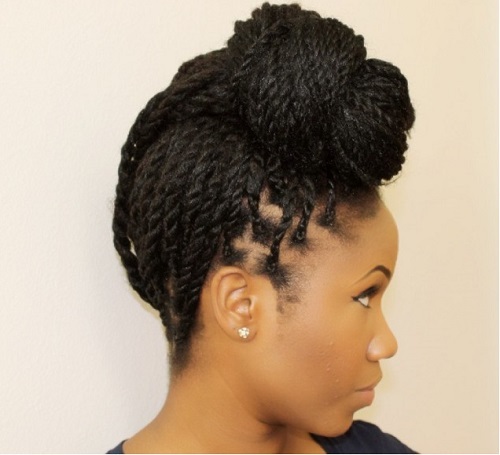 We admire the versatility of this hairstyle, as it can be applied on any hair texture. The voluminous, curly bangs in the front are truly the cherry on top to leave a marvelous impression. 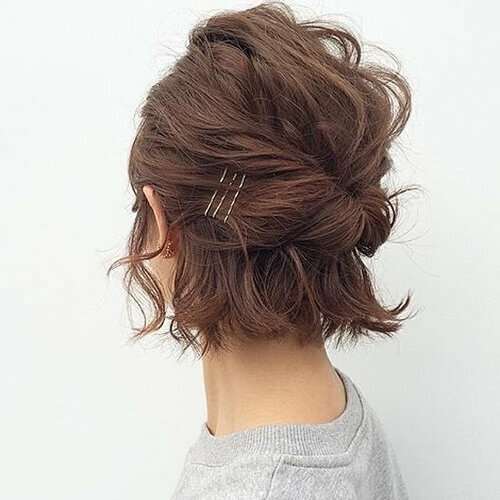 To put it in a nutshell, updos for short hair are not only possible, but they’re numerous! Don’t ever let styling get in the way of your bold haircut idea. We promise that there are more than enough styling options to get you excited about any courageous makeover. Even if you already have short hair, we’re positive that you’ll be inspired by at least a part of these brilliant ideas. What’s your top 5?